Aryaman Singh picked up his first set of golf clubs at the age of 3. His foray into competitive golf began at the age of 5, when he competed at the Poona Club Tournament in the under-9 age category and won it three successive times. At the age of 6, he began competing in the Indian Golf Union sanctioned West Zone Tournament however his first win on the tour came at the age of seven in 2014. Same year, the young Pune golfer also bagged the Indian Golf Union – West Zone ‘Order of Merit’ in 2014 in his age category. A feat he repeated in 2015 and 2016 with the distinction of winning every tournament he participated in over these three years ! 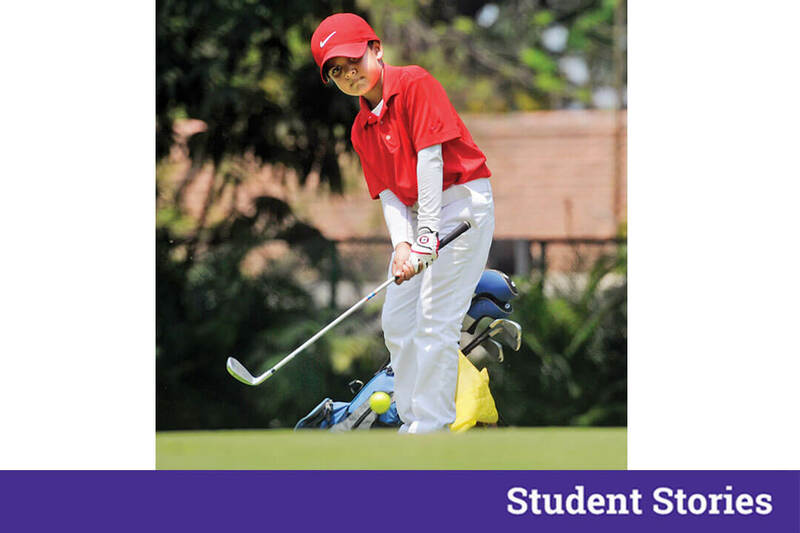 In 2013, he became the youngest Indian to qualify and represent India at the Callaway Junior World Championship in San Diego, California, and the US kid World Golf Championship in Pinehurst, North Carolina. 1)Aryaman, how did you start playing Golf and from when are you practicing it? I come from a background where everyone played a lot of sports, so by the age of 3, my dad had already introduced me to a number of sports. My first exposure to Golf was when I was 3 years old. Ever since then, there’s been no turning back. 2)At such an early age, you have a winning streak of 1,266 which is the longest in the history of junior Golf in India. How did you manage to achieve it? Unlike other sports, Golf is an individual sport. And only I am responsible for the outcome of my round. I find Tournament Golf interesting and exhilarating. I have never focused on a winning streak. I just play the best I can. I am humbled by the outcome. 3)Aryaman, how do you manage your studies with the game? Does the game effect your studies? My school, Vibgyor High, has been very supportive from the start. My parents also help me catch up on missed classes whatever best I can. So far, I have been able to manage both golf and studies. 4)When and where did you play your first game? What was your experience over there? I played my first zonal tournament in the Under-9 category when I was 6. I came first runners up. But it was great fun playing with the bigger kids on a new course in Mumbai. 5)You also have represented India in two most prestigious junior Golf championships. Share your experience being a part of those championships? Some of the best young golfers in the world come for the Junior Golf World Championships in the US. It was a brilliant experience playing with them on some of the toughest courses, under some really tough conditions. The first time I participated in the Callaway Junior Golf World Championship, was at age 6, and I finished Top 15 in my age group. But, what was more valuable was representing India and standing next to the Indian flag at the opening ceremony. 6)Aryaman, will you continue Golf as a profession or do you have some other Future plans? India has produced so many exceptional talents, including scientists, astronauts, sports persons, artists among others. I hope someday I can make my country proud on the world stage in Golf. 7)Whom would you give the credits to for who you are today? First and foremost I’m very grateful to God for this opportunity. I would also give credit to my family for their support and all the effort and sacrifice they make on a daily basis. I’m indebted to my wonderful coaches, who have helped me with my game. I’m also very grateful to all my caddies from whom I’ve learnt a lot about the game. 8) Anything for our young readers you would like so say? I’m still a long way from achieving my dream. But, if I could say something, it would be – work hard, stay grounded, be grateful to everyone and for every opportunity, and remember to have fun when you play any sport. Respect the game that you love.